Inspired by the old saying, “The way you see the New Year in is the way you will live it,” Russians are prepared to splurge during the holiday season. Russian city streets, shopping malls and businesses are aglow with decorated fir trees, lights and tinsel, reminding the locals once again that the long New Year’s break is coming. 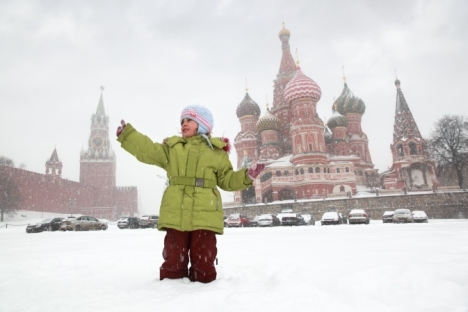 The official New Year holiday break in Russia will last from Dec. 30 to Jan. 8 this year, a week and a half of mid-winter bliss and the envy of citizens of many Western countries, where only Christmas Day and New Year’s Day are federal holidays. Also, unlike in many Western nations, in Russia it’s New Year rather than Christmas that’s the main winter holiday. This tradition is rooted in the Soviet past, when religious holidays were phased out and substituted with secular ones. In moving the focuse from Christmas to New Year, the customs of decorating a tree, celebrating a special day with family and exchanging gifts was just moved to a different date. Popova seems to be one of the few Russians who have prepared for the holiday in advance: “I hate the rush at the stores, the long lines and all that bustle, so I prefer to buy everything before the crowds come, or do it online.” This last option is not yet widespread — the share of online shopping in Russia is still only 5 percent — but lines in stores grow exponentially, especially during the peak period from Dec. 15-24. According to a survey by Deloitte, this year Russians will spend 8.6 percent more on the New Year holidays than in 2011. Experts suggest that this is because they have stronger confidence in their future than they did last year; half of the survey respondents view the economic situation in Russia as stable. On average, Russians spend $500 on celebrating the winter holidays — 35 percent less than in Europe, where the average is $770. But given the 120 percent difference in per-capita GDP between the EU and Russia, this figure looks far more impressive. Russian shoppers are prepared to splurge for the holidays, and not just on gifts and food. It is becoming increasingly popular to go on vacation for the New Year break. Slightly more than half of those who spend their holiday abroad chase the sun. Many Russians head to Egypt, where tour packages start at $400 for the week. Ski holidays are also popular, although the price for this type of vacation is substantially higher. Vadim Nesmeyanov, the 30-year-old founder of an I.T. start-up, is among those leaving snow to find more snow. According to the Deloitte poll, a new smartphone is one of the most desired gifts this New Year. Forty percent of respondents would like a new phone; fifty-six percent said they would be happy with cash. However, most poll respondents said they planned to give cosmetics (42 percent) and candy (38 percent) as presents. Inexpensive household appliances like slow cookers and juicers are also in demand. Russians don’t like to go out on New Year’s Eve; more than 80 percent prefer to entertain guests at home or visit friends in their homes. But not everybody can share in the bliss or afford to forget about work: More than 11 percent of Russians work through the holidays.